More often than not, when it comes to big brands that have a big following and a big variety of products, some of the hidden gems can fall by the wayside. These are the unsung heroes, the incredibly good products that are often overlooked in favour of the more obvious hero choices. One such product is The Body Shop Beautifying Oil. I have two Beautifying Oils at the moment. The first, the Brazil Nut version, is no longer available. I bought a backup bottle of this back when it was in stock in early 2013, and you can see that I’ve just cracked into it. The second, Cocoa Butter*, is a new addition to my bathroom cabinet but equally as fabulous. The Body Shop Beautfying Oil is based around a lightweight blend of nut oils, including Community Fair Trade marula oil. The Body Shop get their marula oil from the Eudafano Women’s Cooperative in Namibia, but the buck doesn’t stop there. Each of the 10 beautifying oils currently available contain a bevy of other Community Fair Trade ingredients. The Cocoa Butter one sources its cocoa beans from the Kuapa Kokoo Farmers Union in Ghana. The Brazil Nut version gets its brazil nut oil from Candela Peru – the founder of which I met last year and he had some fascinating stories to tell! Don’t worry – despite the Brazil Nut range having been a limited edition, Candela Peru’s brazil nut oil is used in many of The Body Shop’s permanent products. Aside from the conscientious list of natural ingredients, The Body Shop Beautifying Oils are just a bloody delight to use. They can be used for the body, hair or face and I often use them for all three. A little bit goes a very long way with these oils, so they last an incredibly long time. I find them just as effective as expensive branded argan oil for smoothing the ends of my hair after washing, and they provide amazing moisture as a body oil. If I’m having a particularly dry day, I like to apply the oil over all my dry patches (usually my arms!) after a shower and follow up with a matching Body Butter to lock it in – much like we would use an oil or serum on the face and follow with moisturiser. Speaking of the face, these do work nicely as facial oils too but you really need the teeniest, tiniest little speck else your skin will never manage to absorb it all. You might also want to avoid using on the face if you don’t like scented products there – the scents are all natural, but they are fairly strong so keep that in mind. 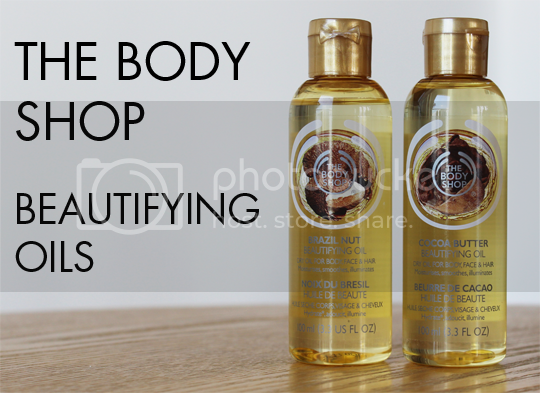 To cap off a great list of attributes, The Body Shop Beautifying Oil costs just £9 for 100ml. With 10 to choose from, you’ll definitely find one you love. What are you waiting for? Give one of these unsung heroes a try. I had the Sweet Lemon one of this and wasn’t enamoured, but then again I’ve never been a huge fan of oils!